Here is a great book to add to your gluten free library. This is an excellent collection of gluten freeÂ recipes inspired by her mother country. Though she grew up in New York, Caponeâ€™s childhood wasÂ steeped in traditional Italian food, from Aunt Carmelâ€™s stoveÂ top to Uncle Zio Joeâ€™s city garden to her own fatherâ€™s pastaÂ bowl. These memories and others gave Capone her passionÂ for cooking. She even toured Italy as a young adult and studiedÂ classic cuisines, growing more and more inspired by what sheÂ tasted and saw. Soon after returning to the United States, Caponeâ€™s health beganÂ to deteriorate. After many misdiagnoses, she self-diagnosedÂ herself as having celiac disease which was confirmed by aÂ gastrointestinologist. Goodbye gluten. Referring to this life transition, Capone writes, â€œBut how could I continue to indulge my passion for ItalianÂ food?â€ The answer to this question is the key to making a successful switch to the gluten free diet: â€œInstead ofÂ concentrating on what it was that I could not eat, I began a culinary journey with the quest of discovering just howÂ many delicious foods I could reshape and create new.â€ Her attitude is a beautiful example of how to overcome anyÂ difficulty. Capone began experimenting. Flour blends were of course the most difficult to learn, since gluten free dough isÂ nothing like whole wheat dough. But Capone kept her optimism and kept trying. In 2005, Capone opened a school for fellow celiac cooks, The Wheat-Free Gourmet Cooking School. She beganÂ passing on her knowledge to her students, enthused and excited about sharing delicious gluten free Italian dishes. The Gluten-Free Italian Cookbook slowly developed on the side as Capone fine-tuned her recipes. All of the recipes in her cookbook have been tested and tried by Capone and her students. They are grouped by mealÂ stages, starting with appetizers and ending with desserts. The bread and pasta section is very detailed, includingÂ tips for working with gluten free dough and specific flour blends. 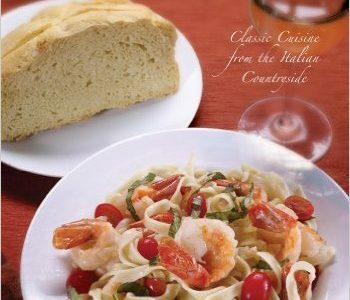 Recipes include four season pizza, cheese andÂ spinach ravioli, manicotti, caramelized Italian plum cake, and much more. Mary Caponeâ€™s passion and enthusiasm for cooking, combined with her optimism in the face of Celiac disease,Â definitely shine throughout her recipes. She is a natural teacher, invested in passing on her knowledge to others.